Is the Old Spaghetti Factory Haunted? The history of the old spaghetti factory is fairly plain im afraid. It opened in March of 1970 in a building bought from a grocery wholesaler. The interior is decorated with interesting pieces from the early 1900's and is regarded as a very fine place to dine. It remains open to this day as a restaurant. The restaurant is thought to be home to four ghosts, with the most well known of which being the spirit of a tram conductor. He is thought to have operated the tram inside the restaurant, which actually has tables in it, before his time came. Returning to memories of a job he loved so much he now frequents the restaurant and has even been captured in a number of photos, always seen sitting at the same table at one end of the tram cart. It seems that he would be the one for items on the tables inside the cart moving on their own and the inexplicable temperature drops which many a diner has experienced. The next ghosts is known as the "little red man" due to his short stature and red hair. He is known to be a mischievous ghost who likes to annoy and play tricks on the staff. One of his favorite things to do is call out the name of staff members, as if enjoying their expressions when they turn round to see no one there. People have also claimed to have seen him within the kitchen area, appearing out of no were and scaring staff. There's also a story of two women who say they saw him stroll out of a cubicle in the women's toilets wearing a red shirt and long johns, only to look at the puzzled women laughing and then strolled out of the door. When they questioned staff about who he was no one claimed to have seen such a man anywhere in the restaurant. Who he is and why he's here is a complete mystery. The next ghost is that of a young girl who has been seen standing near the front window holding a balloon. Who she is or why shes there is unknown, but a staff member once claimed to have had a conversation with her once and claimed she was looking for her mother, but upon telling another member and returning to the window, she was gone. The last spirit at the restaurant is a young boy who has a rather scary appearance. There's a story from 2012 about a server who saw a young boy running about the tables at night after closing. Thinking this strange she followed him to a table he ran under, but upon holding back the table cloth to see him she saw something which scared her so much she went to the manager and quit on the spot, claiming she could no longer be in the building. 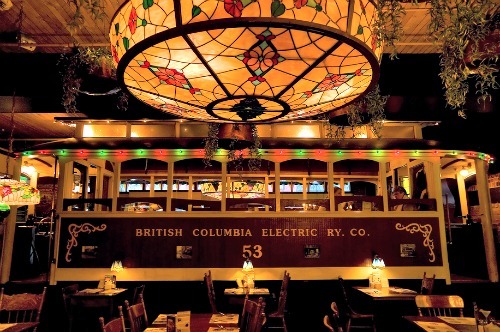 Who he is remains forever unknown, but a psychic who once visited the restaurant claimed his name to be Edward, and also suggested that a number of objects within the building have spirits attached to them, most notable of which being the tram cart in the center of the floor.